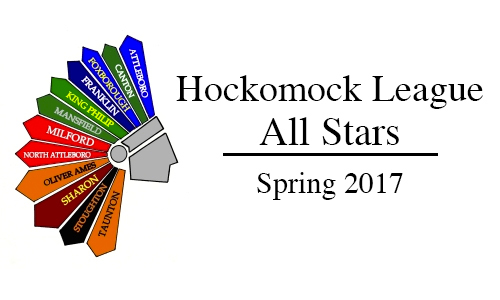 Below are the official 2017 Hockomock League Boys Lacrosse All Stars, selected by the coaches in the league. 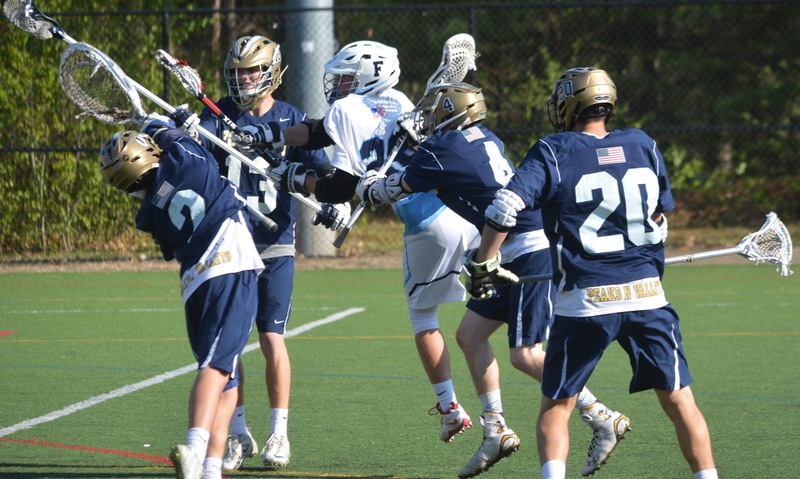 For a history of recent Hockomock League Boys Lacrosse All Stars, check out our history section. Today’s games are listed below. We will update this post with any changes we receive. Attleboro, 9 @ Canton, 4 – Final – Attleboro senior Tyler McGovern tossed four-plus innings with just one hit allowed, striking out six to earn the win. Sophomore Troy Van Vliet paced the offense, connecting for a pair of doubles, knocking in three runs and scoring two runs of his own. Franklin, 5 @ North Attleboro, 1 – Final – Five different Panthers recorded a hit and junior Jake Noviello shined in his season debut on the mound to lead Franklin past North Attleboro. Noviello tosses six inning, allowing four hits and two walks while striking out seven. Bryan Woelfel struck out two in a shutout inning in relief. Noviello also recorded a hit and scored a run on offense. Sophomore Alex Haba went 1/3 with a double, two RBI and a run scored, senior Cam Lupien added a hit, a run and an RBI, senior Josh Macchi had a double and a run scored and senior Jake Lyons had an RBI and a hit for the Panthers. Milford, 2 @ King Philip, 4 – Final – King Philip senior Chris Wing tosses six innings, allowing just a pair of hits while retiring the side in order in each the second, fourth, fifth and sixth innings. Sophomore Jack Webster recorded the save. Offensively, the Warriors notched eight hits as a team with Collin Cooke (RBI) and Ryan Coulter each recording two. Ben Furfari knocked in a pair of runs and Webster also had an RBI. Stoughton, 2 @ Oliver Ames, 6 – Final – Oliver Ames scored a pair of runs in both the third and fourth innings while tacking on single runs in the first and sixth innings to open the season with a win. Junior Matt Muir went 2-for-4 with a pair of triples and a pair of runs scored while senior Kyle Gagliardi was 2-for-4 with a pair of RBI. Sam Burr earned the win on the mound, scattering six hits over 6.1 innings with two runs allowed. Sharon @ Taunton – Postponed to Friday, April 21 at 11:00AM. Franklin, 1 @ North Attleboro, 2 – Final – North rallied from a run down in the bottom of the seventh inning to open the season with a win. Sam Courtemanche led-off the inning with a double. Ashley Cangiano came in to run and scored on an Abbie Gallagher grounder. With the bases loaded, Meg Barlow (2-for-3) provided the walk-off hit with a double. Bella Erti threw a complete game for North with four strikeouts and five hits allowed. King Philip @ Milford – Postponed to Friday, May 5 at 3:30. Oliver Ames, 0 @ Stoughton, 6 – Final – Gina Carafa threw a five-hit shutout for the Black Knights, striking out eight and only walking one. Alessandra Loffredo provided Stoughton with offense from the nine-hole, hitting a two-run homer in the sixth. Victoria Ziner went 2-for-2 and reached base three times for OA. Sharon, 0 @ Taunton, 19 – Final (5 inn.) – The Tigers got off to a dominant start behind three, one-hit innings and six strikeouts from Courtney Fisher, who also went 3-for-3 with an RBI. Jamie Brown went 3-for-5 with a double, triple, and an RBI and Kya Enos, Jaylin Couto, Hannah Aldrich, and Rebekah Lajoie each had two hits apiece for Taunton. Lajoie drove in four runs. Attleboro, 6 @ Oliver Ames, 5 – Final (2OT) – Zach Thomas scored his second of the game with less than a minute to play to tie the game and junior Alex Banner netted the game-winner in double overtime to lift the Bombardiers past OA. Cam Littig added a pair of goals for Attleboro while senior Andrew Milliken scored once. Banner, Seth Lombardy and Zach Viau each notched an assist as well. Sophomore Trevor Koppy made 14 saves in net for the Bombardiers, who battled back from a 3-1 deficit at halftime. Head coach Kevin Koppy credited the play of defensemen Jim Nordberg, Matt Potter, Chris Reynolds and Tyler Koppy for holding the Tigers to just two goals in the second half. For Oliver Ames, Eric LeBlanc scored a pair of goals while Owen Gallagher, Jack Lang and Colin Bourne each scored once. 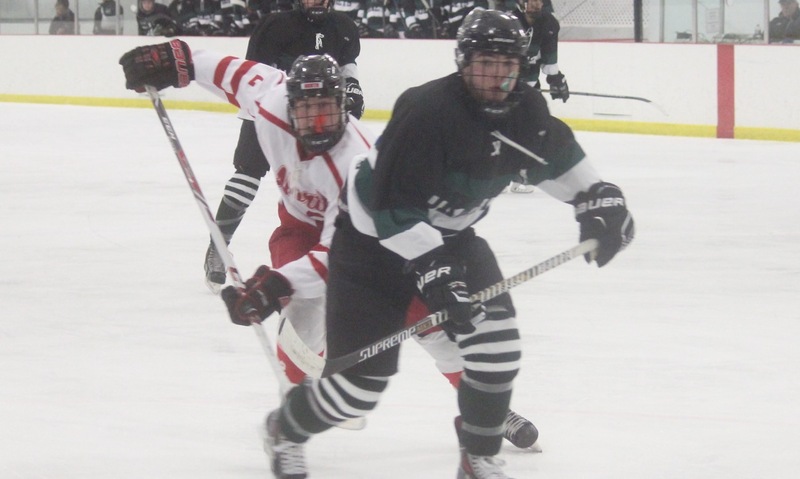 North Attleboro, 7 @ Bishop Feehan, 6 – Final (OT) – North Attleboro senior Colin Young scored his lone goal of the game in the overtime period to lift the Rocketeers. Tommy Lindstrom netted a hat trick while Zach McGowan added a pair of goals and one assist and Jack Dakin notched three assists. Nick Moore scored once and set up Young for the game-winner. Dan McDonald had 13 saves in the cage for Big Red. Oliver Ames, 16 @ Attleboro, 2 – Final – Eight different players found the back of the net as Oliver Ames cruised to a non-league win on the road. Kendall Clifford accounted for five goals while Sofia Masciarelli scored our and Liv Piazza had three goals. Ariana Waldorf recorded 13 saves in goal for the Tigers. Franklin, 13 vs. Lincoln-Sudbury, 7 – Final – Franklin built a 6-3 lead by halftime and then continued its strong offensive showing in the second half. Sophomore Annie Walsh and freshman Erin Walsh each scored goal goals apiece and Caroline Lounsbury added a pair for the Panthers. Dana Lewandowski played well on defense with three ground ball and freshman Gianna Cameron made nine saves in net. Taunton, 16 vs. Norton, 8 – Final – Delaney Powell scored six goals and Alana Tavares added five for the Tigers, who opened the season with a non-league win. Annie Tate and Abbey Kingman both had hat tricks for Taunton and Lorna Li had 12 saves. Franklin, 4 @ North Attleboro, 1 – Final – Senior Rahul Herur and freshman Rohan Herur each won in singles while while the Panthers swept doubles in a victory over North. Rahul Herur won 6-3, 6-1 at first singles while Rohan Herur took third singles, 6-1, 6-1. The team of James Johnstone and Derek Wu won 6-3, 6-1 at first doubles and Tyler DiPalma and Saketh Saripalli won 6-2, 2-6, 6-1 at second doubles. North Attleboro’s Barsomo Nuay won 6-4, 6-1 at second singles. King Philip, 5 @ Milford, 0 – Final – An experienced King Philip team opened the season with a sweep on the road at Milford. Cole Ginter won 6-0, 6-0 at first singles, Martin Martous won 6-0, 6-2 at second singles and Blake Ginter took third singles 6-1, 4-6, 6-4. Ryan Gemelli and Sam Colella teamed up for a 7-5, 6-4 win at first doubles and Jake Webster and Marco DiStefano took a 6-4, 6-0 win at second doubles. Oliver Ames, 2 @ Stoughton, 3 – Final – Stoughton got wins at first and third singles as well as first doubles to earn the program’s first win in two seasons. Senior Stevens Bontemps won 6-2, 6-3 at first singles and sophomore Alex Bernstein picked up a 6-3, 6-4 win at third singles. The team of senior Jon Podesta sophomore Erik Anderson clinched the win with a 6-2, 7-5 win at first doubles. Oliver Ames junior Joseph Lorizio won 7-5, 6-1 at second singles and Greg Mueller and Michael Souza won 6-4, 2-6, 10-6 at second doubles for the Tigers. Canton, 2 @ Attleboro, 3 – Final – Attleboro picked up wins at first and second singles and another at first doubles to edge Canton. Torey Lussier won 6-3, 3-6, 6-2 at first singles while Brianna Aronne won 6-1, 6-2 at second singles. The team of Taylor Palermo and Merri Piazza came back to claim a 1-6, 6-4, 6-3 win at first doubles. Canton’s Jamie Cree won 3-6, 6-4, 6-4 at third singles and the team of Stelina Michaelidis and Kiki Karavas won 6-2, 6-3 at second doubles. North Attleboro, 4 @ Franklin, 1 – Final – North Attleboro didn’t drop a game at either second singles or first doubles while also getting victories at third singles and second doubles. Jordan Willis won 6-0, 6-0 at second singles and the team of Gabby Duva and Azka Siddiq won with the same score at first doubles. Shurobhi Nandi won 6-1, 6-2 at third singles and the team of Katie Demontigny and Hana Hershey won 6-1, 6-0 at second doubles. Franklin’s Hannah Sweeney won 6-0, 6-1 at first singles. Stoughton, 1 @ Oliver Ames, 4 – Final – Oliver Ames swept singles play and also got a win at second doubles to earn the win over Stoughton. Sarah Leger won 6-0, 6-3 at first singles, Claudia Ferrara won 6-2, 6-1 at second singles and Mandi Miller swept third singles 6-0, 6-0. The team of Kristin Bloumbas and Olivia Groebe won 6-2, 6-1 at second doubles. Stoughton’s Alex Soto and Amanda Gallant won 4-6, 7-5, 6-0 at first doubles. Sharon, 5 @ Taunton, 0 – Final – Sharon didn’t drop a single game in singles play and also won both doubles matches to get the sweep. Sophomore Nupur Shukla, freshman Emily Zhang and junior Lulu Yuan all won 6-0, 6-0 at first, second and third singles, respectively. The team of juniors Katie Merport and Emily Wen won 6-4, 7-5 at first doubles while junior Rithic Neti and sophomore Sophia Fein won 6-1, 6-1 at second doubles. Taunton, 3 @ New Bedford, 0 – Final – Taunton notched its second won of the season with a 26-24, 25-18, 25-17 win on the road over the Whalers. Lance Law led the way with 10 kills, four aces, six digs and one block while Lens Esquil had nine kills and two blocks and Nate Grant had 30 assists, three kills and a block. The Bombardiers made an improbable run to the Div. 3 South semifinal before being eliminated by Hanover. Even with a short bench and a goaltender that had never played before, Attleboro won three tournament games for the first time in program history and this year will try to build on that experience and get back to the postseason. With 20 players on the roster, depth may not be Attleboro’s strength but there are some players that Cripps will be counting on to produce this season led by senior forward Keagin Larkin. He will be helped out on the forward line by junior P.J. Elliott and sophomore Sam Parker. Freshman Sam Larkin will also step in right away and Cripps said that he has been “impressive” during the opening two weeks of practice. Senior goalie Tim Gile returns between the pipes after a season that saw him put on goalie pads for the first time. He will be joined at the goalie position by junior Tyler Koppy. In front of goal, seniors Will McKenzie and Jack Flynn and sophomore Sam McKenzie will be part of Attleboro’s defensive corps. How does Franklin follow up its first ever appearance in the prestigious Super 8 tournament? How does the program recover from losing 21 seniors off a roster that finished unbeaten in the Hockomock League and had one of the league’s most exciting hockey moments when it beat Xaverian in overtime in the Super 8 play-in game? Those are tough questions that head coach Chris Spillane will be trying to answer in the coming weeks as he incorporates almost an entirely new roster. The top returning scorer from last season is senior Alex Bissanti, who chipped in with five goals as a junior. He will be joined up front by junior Adam Assad, who Spillane said has “lots of offensive potential.” In addition, the coach noted that he is looking towards a “strong” sophomore class to provide a spark offensively. The Warriors numbers were not huge this winter and depth may not be a strength, but Carlow is excited about the talent that KP will send out on the ice with six forwards and six defensemen returning from last year’s squad. The Warriors will be led on the forward line by senior captain Matt Smith, while fellow captain Clay Guess will lead an experienced blue line group that also includes football star Corey Lombardo. Sophomore Collin Cooke is a player to watch this season and is poised for a breakout winter after scoring 11 goals and 10 assists as a freshman. Fellow sophomore Dan McLoughlin could be a player that steps in and provides a spark along with junior Richie Lucente, who saw plenty of ice time last season. Carlow also said that junior Jeremy Smith should step right in at defense. He noted that Smith had the talent to get on the ice as a sophomore but was only limited by the experienced players ahead of him. Mansfield enters another season as one of the main threats to Franklin in the Kelley-Rex division. The Hornets, who are the only other team to have won the division (in 2011), are one of the few programs to consistently have the talent base to challenge the Panthers and this season is no different. Junior forward Matt Farragher is primed for a breakout season after scoring 13 points as a sophomore and he will be paired up front with several classmates, including Pat Sunderland and Chad Piotti. Seniors Pat Graham, Shane Doherty, and Max Hoffman will return to give Mansfield strength in depth along its first two lines and the firepower to make the Hornets a dangerous team in the Hock. Mansfield also has the potential to be strong defensively, as demonstrated by a scoreless tie with Winthrop on Saturday. Anthony Visconti, who gave up just more three goals per game last season, returns in goal and he will be helped out by senior defenseman Mike Arnold, who leads the blue liners, along with classmate Tim O’Brien. The Hornets have experienced returning players, but there is plenty of youth coming through program as well with two freshman and five sophomores on the varsity roster. Franklin may remain the team to beat, but Mansfield is confident that it will be right there pushing the Panthers to the end. The Rocketeers made it back to the tournament last season but were knocked out in overtime by Milford in the first round. With Sean Young graduated, North Attleboro will be looking for someone that can step into his role as the primary scorer and make a run at a first league title in its final season in the Kelley-Rex. There is a lot of depth returning for North this season led on the forward line by senior captains Andrew Casson and Brian Poillucci and juniors Zach McGowan and Erik Clements, each of whom have years of experience for the Rocketeers. Sophomores Jason McNeany and Andrew Wissler and a strong freshman class will add to the forwards over the course of the season. Defensively, North Attleboro will count on juniors Paul Baker and Vincent Zammiello and senior Matthew Marceau on the back line. The defense will be key and Snizek is expecting his forwards to help back as well as the Rocketeers will be using freshmen Chris Ulrich and Ryan Warren in goal this year. Among the players that Metea highlighted this season are junior Nick Terry, who is coming off an all-star season, and senior Tyler Pietrzyk, who will both be starters. Junior Zack Albert and sophomore Will Walsh will add depth to the forwards as well. Defensively, senior David Perry and junior Mike Volkmann will be two of the key players and add a physical component to the Tigers. Taunton has three goalies on the varsity roster and Metea has confidence in all of them to win games. Senior Cam Pitts is the most experienced of the trio but junior Justin Chappell and freshman Griffin Speicher both will see time as well.